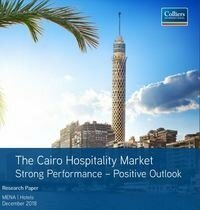 Hotel Occupancy expected to continue its upward trend in 2019 after a 2018 of increased occupancy due to the stabilizing of the socio-economic situation after the devaluation of the EGP. These were the findings of a Collier's international report. 55% of incomers were from Gulf Cooperation Council countries followed by local tourism then European visitors. Higher rates are expected in 2019 due to government projects like The Grand Egyptian Museum in Giza and the Maspero triangle.